The Bible for Pentecostals, to download free on your phone. Pentecostalism is a brand of evangelical Protestantism and emerged in the early 20th century in the United States. Protestantism is a form of Christian faith originated by the Protestant Reformation and includes several denominations as Lutheranism, Pentecostalism, Anglicanism, Baptists, Methodism, evangelical, charismatics and others. There are now over 250 million Pentecostals worldwide and the movement is growing every day in USA, Latin America, Africa and South Korea. Pentecostalism comprises a large number of independent churches, including the Assemblies of God. Pentecostalism places emphasis on a direct personal experience of God through the baptism with the holy spirit. The Term Pentecost is derived from Pentecost, the Greek name for the Jewish Feast of weeks. For Christians the Pentecost commemorates the descent of the Holy Spirit upon the followers of Jesus. The day of Pentecost is the unique visit of the Holy Spirit to the earth. Pentecostalism emphasize in the reliability of the Bible and adhere to the Bible’s divine inspiration and inerrancy. Like other Protestant Bibles, the Pentecostal Bible comprises 39 books of the Old Testament (according to the Jewish Hebrew Bible canon) and 27 books of the new Testament, for a total of 66 books. This Pentecostal Version of the Holy Book excludes the seven books approved by the Catholic Church and considered non-canonical by Protestant. The Old Testament consist of: Genesis, Exodus, Leviticus, Numbers,Deuteronomy, Joshua, Judges, Ruth, 1 Samuel, 2 Samuel, 1 Kings, 2 Kings , 1 Chronicles, 2 Chronicles, Ezra, Nehemiah, Esther, Job, Psalms, Proverbs, Ecclesiastes, Song of Solomon, Isaiah, Jeremiah, Lamentations , Ezekiel, Daniel, Hosea, Joel, Amos, Obadiah, Jonah, Micah, Nahum, Habakkuk, Zephaniah, Haggai, Zechariah, Malachi. The New Testament consists of: Matthew, Mark, Luke, John, The Acts, Romans, 1 Corinthians, 2 Corinthians, Galatians, Ephesians, Philippians, Colossians, 1 Thessalonians, 2 Thessalonians, 1 Timothy, 2 Timothy, Titus, Philemon, Hebrews, James, 1 Peter, 2 Peter, 1 John, 2 John, 3 John, Jude, Revelation. 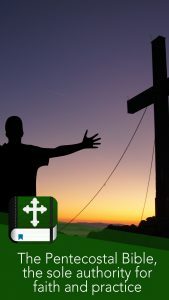 Read our Pentecostal Bible, the unique authority for Christian beliefs and practices. Trust Jesus Christ as Lord and Savior and you’ll be saved.